You can think of the Enneagram as a map that describes and explains human behavior in an accurate and accessible way. It shows us those common repeating patterns of behavior that we all tend to exhibit unconsciously, and it reveals the underlying motivations or drivers of this behavior. It’s hugely important in deepening awareness of self and of others, and provides insight into the nature of our relationships. The model itself combines ancient wisdom with modern psychology in a sophisticated and elegant way. The word “ennea” is a Greek word meaning the number “nine”. The word “gram” derives from the Greek word “grámma” and indicates “that which is written” or “that which is drawn” and it appears in words such as “diagram” and “anagram”. So the word Enneagram implies a “picture of nine”. The “nine” refers to nine personality styles and their related behavioral patterns. It’s worth bearing in mind that none of the nine styles is better or worse than any other. All can function exceptionally well and positively when they are operating at their best (on a good day!). Equally, all can be damaging and destructive when operating at their worst (on a bad day!). The Enneagram touches on something that is fundamental to the human condition. Evidence of this is that people from many different cultural, national, and ethnic origins, and from a wide variety of spiritual and philosophical traditions, can recognize themselves somewhere in the nine characteristic styles described in this model. The Enneagram is a circular model with nine numbers located on its perimeter representing nine “personality styles”. Each style tends to pay attention to different aspects of the environment and has particular habitual ways of thinking, feeling (emotion) and acting in the world. The nine styles are subdivided into three groups of three. These groups are known as “centers”. The three styles in each center are similar in some ways, and very different in other ways. It’s like three members of the same family where all have the same surname but different first names; there’s a family resemblance, yet a definite uniqueness to each individual. Enneagram teachers name the centers in their own idiosyncratic way but they are commonly referred to as Head Center, Heart Center, and Gut Center. We each display aspects of all nine Enneagram styles, and different contexts or environments may draw out certain behavioral patterns that are not usually characteristic of us. For example, our behavior often changes when we’re feeling particularly stressed relative to when we’re relaxed. Each of the nine styles in the model is connected to two other styles by lines which indicate how our behavior can change under certain conditions. This highlights an important point – if we want to understand why people behave in a particular way, we can’t look at their behavior in isolation. We have to consider the context within which the behavior occurs. The reason is that people tend to adjust their behavior in response to the context. Context refers to the external environment as well as the individual’s internal experience. Probably as a result of genetic predisposition combined with significant early experiences, we adopt one of the nine Enneagram styles as a dominant feature. We tend to display our dominant style, or behavioral pattern more frequently than the patterns associated with the other eight styles, and it’s likely to be particularly prominent when we are less conscious and more reactive. Our dominant Enneagram style powerfully affects the way we interpret events and people and sensitizes us to specific circumstances and conditions. Having said that, each of us has access to all nine Enneagram styles which we use either more or less frequently depending partly on how “fixated”, or stuck, we are in our dominant style, and also on the context that we find ourselves in. As you start to understand and apply the Enneagram in your life you may become aware of behavioral patterns that you’ve been reactively and unconsciously repeating resulting in particular outcomes. The model describes these behavioral patterns and helps us understand their underlying drivers or motivators. In this way, the focus isn’t only on what we do; it’s also on why we do it. This depth of insight is extremely useful when working with oneself or others developmentally and offers the opportunity to work at the level of root-cause rather than at the surface or symptom level. In a way, observable behavior is a “symptom”, just like a fever when we’re feeling ill. The fever isn’t the main problem; it’s the underlying cause of it that’s the real issue. There’s a principle suggesting that we can only deliberately change the things that are in our “line of sight” (i.e. things that we can observe, be aware of, and make sense of). The Enneagram is able to bring what was perhaps previously unseen about ourselves into “line of sight” and our Five Lens Personal Feedback reports aim to share some of this with you. This may lead to a level of awareness where you consciously choose a different response to a familiar situation and this could lead to a different outcome. In this way, we start to intentionally build a wider repertoire of consciously chosen response patterns. This means less “stuckness” and more adaptability, less unconscious reactivity and more deliberate choice, and the possibility of increased effectiveness in a wider range of contexts. 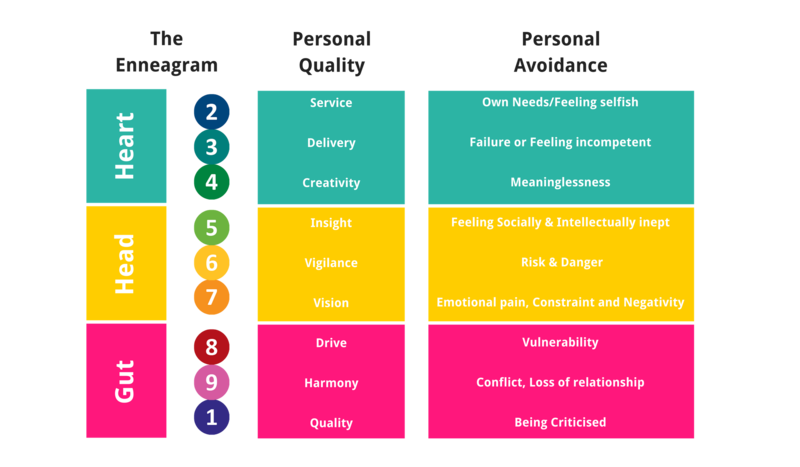 We see the Enneagram as a model that’s integral to people development. When used sensitively and skillfully it can compassionately show people the “box” that they are already trapped in by virtue of the unconscious use of repetitive routine behaviors. Even more importantly, it can show them the door leading to freedom of choice and mastery of self.